The litmus test for Qatar’s effort to address the most heinous aspects of its controversial kafala or sponsorship system will be a judgement this spring by world soccer body FIFA on whether the measures are sufficient to uphold the Gulf state’s right to host one of the world’s foremost sporting mega events. The Gulf Times, a major English-language Qatari paper with close ties to the ruling family in what is a controlled media environment, touted the reforms as evidence of the Gulf state’s ”keenness to better labour standards.” The announcement of the reforms was Qatar’s making good on a pledge to change its labour laws by the end of this year. The reforms aim to ensure timely payment of wages, ease restrictions on leaving the country, eliminate financial liability of employers for their employees, facilitate workers’ ability to find new employment once their contract terminates, prevent confiscation of workers’ passports, ensure proper housing and mechanisms to monitor adherence to employers’ legal obligations, and introduce a model contract. In its summary of the reforms, The Gulf Times however made no mention of a series of recommendations that are central to FIFA’s evaluation and activists’ demand. The most immediate unaddressed recommendation in terms of FIFA is the report’s call for the establishment of an independent commission to oversee the reform process. Theo Zwanziger, the FIFA executive committee member mandated to monitor Qatari progress, warned earlier this month that the world body’s members could deprive Qatar of its World Cup hosting rights at a FIFA congress in May if it failed to establish the commission by March 10 2015. “Unfortunately, almost nothing has happened until today. I strongly doubt the will to change something of the Qataris,” German publication Sport Bild quoted Mr. Zwanziger as saying. Among other key recommendations spelled out in 14 pages of the 139-page report that appear to remain unheeded by the announced reforms and are likely to provoke the ire of trade union and human rights activists are a call for introduction of a minimum wage that would abolish discriminatory salary scales based on nationality; recognition of workers’ right to freedom of movement, association, representation and collective bargaining; criminalization of breaches of health and safety standards; and transparency on incidents of work-related injuries and deaths. A number of these recommendations such as transparency on work-related incidents could have been incorporated in the current reforms without sparking political controversy in a country where nationals account for only 12 percent of the population and fear that granting rights to foreigners would threaten their culture and grip on their society and state. Incorporation would have served as further evidence of Qatar’s sincerity amid continued negative reporting on workers’ conditions. The Guardian reported this weekend that in 2014 a Nepalese worker employed on World Cup-related projects had on average died every two days. The paper asserted that the death toll would rise to one a day if the deaths of Indian, Sri Lankan and Bangladeshi workers were included. Similarly, the Gulf Times cited as evidence of Qatar’s keenness to improve workers’ conditions the adoption by two major Qatari institutions, the Qatar Foundation and the 2022 Supreme Committee for Delivery & Legacy, of standards that go a far way to improve workers’ living and working conditions. Those standards, which are applicable only to the two institutions’ contractors, could have been included in the labour law changes that would have made them nationally binding. The citation appeared however to suggest without stating that explicitly that the standards would serve as the basis for a new national model for workers’ contracts. By the same token it remains unclear how the easing of departure from Qatar of migrant workers by abolishing the requirement of an employer’s consent and replacing it with a 72-hour grace period managed by the interior ministry squares with the DLA-Piper’s recommendation of recognition of the right to freedom of movement. To be fair, the lawyers’ call for workers’ freedom of association, representation and collective bargaining, goes to the core of Qatari society, politically and socially. It calls into question not only the autocratic nature of Qatari rule, but also fuels fears of the minority population of Qatari nationals to whom greater rights for foreigners constitute an existential threat. Many Qataris privately acknowledge that the demographics of their country are unlikely to change but seem unwilling to do more than tinker with their system at the fringe in the absence of a solution that does not threaten their culture and grip on society. The risk is that legitimate Qatari fears will keep Qatar’s at odds with the trade unions and human rights groups. Qatar’s probable advantage is that in terms of the World Cup FIFA is more likely to focus on working and living conditions than on workers’ political rights. A Saudi-led proxy war against Iran playing out in Syria and Iraq has expanded onto the soccer pitch with a last minute decision by the Palestinian national team to cancel a friendly against Iran. The cancellation officially on technical grounds came barely two weeks before Iran meets two of its Gulf nemeses, the United Arab Emirates and Bahrain, in politically loaded matches during the Asian Cup in Australia. It also highlights internal divisions among the Palestinians as Hamas, the Islamist group in control of Gaza, seeks to patch up its differences with Iran. Iranian suspicion that the Palestinian cancellation four days before the friendly was scheduled to take place is rooted in close ties between the Palestinian Authority on the West Bank headed by President Mahmoud Abbas and conservative Gulf states as well as Mr. Abbas’s deteriorating relations with Hamas. Iranian officials and soccer analysts doubt the cancellation had anything to do with soccer. The officials and analysts noted that the Palestinian squad had recently trained and played matches in the UAE and Saudi Arabia whose relations with Iran have long been strained. The two Gulf states alongside Bahrain believe that Iran has sought to fuel discontent in their countries and is responsible for the popular uprising in Bahrain that was brutally suppressed in 2011 as well as unrest in Saudi Arabia’s oil-rich, predominantly Shiite Muslim Eastern Province. Saudi Arabia whose puritan Wahhabi interpretation of Islam is inherently anti-Shiite has poured billions of dollars into becoming a dominant force in Muslim communities across the globe since the 1979 Islamic revolution in Iran. Saudi responses to the popular revolts that have swept the Arab world in recent years and sparked a brutal civil war in Syria as well as to the crisis in Iraq and the rise of jihadist groups like the Islamic State, which controls a swath of Iraq and Syria, have been characterized by their anti-Shiite, anti-Iranian overtones. To be sure, the Islamic State is no less sectarian with its murderous campaigns against Shiites and other religious minorities. The Saudi responses reflect the fact that the kingdom’s ruling family cloaks itself in the mantle of Islam to justify its absolute power that is becoming increasingly harsh in its crackdown on domestic sent. A Saudi court in recent days referred to a court that deals with terrorism cases two women arrested a month ago for violating a ban on women driving. Saudi rulers see any alternative form of Islamic government, particularly ones that involve popular legitimization through elections like Iran or the rise in Egypt of the Muslim Brotherhood with the election in 2012 of Mohammed Morsi, as a direct threat. Mr. Morsi was toppled a year later in a Saudi and UAE-backed military coup. In a letter to his Iranian counterpart, Palestine Football Association (PFA) secretary general Abd Al-Majid Hujjah said his squad had just returned from a visit to China and was preparing for next month’s Asian Cup in Australia and therefore was unable to travel to Iran. Mr. Hujjah stressed Palestine’s brotherly relations with Iran and expressed hope that the countries’ teams would have a future opportunity to meet. The PFA, locked into a campaign to get Israel suspended by world soccer body FIFA for alleged obstruction of the development of Palestinian football that is part of a broader effort to squeeze Israel within international organizations, needs Gulf support. Palestinian peace negotiator Saeb Erekat was quoted by Israeli media as saying that the United Nations Security Council could vote within days on a resolution that would call on Israel to withdraw from occupied Palestinian territory by 2017. After years of failed mediation efforts, FIFA this month warned that Israel could be sanctioned if it failed to ensure the free movement of Palestinian players. The Palestinian cancellation of the Iranian match came not only at a sensitive moment in Palestinian diplomacy but also at a time that efforts to bridge the divide between the Palestinian Authority and Hamas are faltering further. Hamas charged that the authority’s security forces had this week arrested 14 of its operatives on the West Bank. Squeezed by pressure from both Israel and Egypt in the wake of this summer’s destructive war with Israel, Hamas sent a delegation to Tehran earlier this month to repair relations ruptured by the Sunni Muslim Islamist militia’s refusal to back the government of Syrian President Bashar al-Assad. A renewal of ties would not only complicate Hamas’ relations with the authority but would also serve Iran’s argument that it is the Gulf states rather than the Islamic Republic that is fuelling sectarianism in the Middle East. PFA President Jibril Rajoub, who a year ago became the first representative of Mr. Abbas to visit Tehran in years, has urged Hamas to break its ties to the Muslim Brotherhood – a demand that is in line with Saudi Arabia and the UAE who have outlawed the group as a terrorist organization. Mr. Rajoub’s visit focused on efforts to lift a Syrian siege of the Yarmouk Palestinian refugee camp in Damascus and win Iranian support for Mr. Abbas’ UN efforts. A deputy secretary of the central committee of Mr. Abbas’ Al Fatah movement and former head of Palestinian security, Mr. Rajoub needs to reassure Gulf states who worry about the fact that he has close personal ties to Hamas leaders should he want to succeed Mr. Abbas as head of the Palestinian Authority. Mr. Abbas has suggested on a number of occasions that he wishes to retire. The Authority and Mr. Rajoub are walking a tightrope. Cancellation of the match against Iran will earn them brownie points in the Gulf but not contribute to relations with Iran, which has suggested that it would abide by any decision the Palestinians take with regard to Israel. “The match against Palestine was agreed upon on October 3. The Palestinians had 80 days but said they were not coming just four days before the match. This is neither legal nor professional… In the worst of cases, this constitutes regional collusion with the United Arab Emirates and Saudi Arabia,” charged Mehdi Rostampour, a well-known Iranian soccer analyst, in a posting on his Facebook page. Almost four years after FIFA’s decision to award the 2022 World Cup to Qatar, the country has had more difficulty keeping the bid than winning it, with scandal and speculation continuing in 2014. The UK’s Sunday Times revealed in June a “bombshell” cache of millions of leaked emails and documents, some showing Mohammad bin Hammam, Qatar’s former top football official, allegedly using his wealth and contacts to help the country’s chances of hosting the tournament. Qatar vehemently denied any wrongdoing, saying its bid “upheld the highest standard of ethics and integrity,” and adding that Bin Hammam “played no official or unofficial role” in the bid committee. Qatar had already been under the international spotlight a few weeks earlier, when UK daily The Guardian reported that hundreds of migrant workers had died since construction of the World Cup infrastructure began. 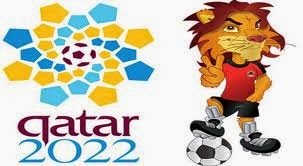 Qatar has until March 2015 to meet a deadline for specific labor reforms or risk losing the 2022 World Cup, Reuters reported. The country also endures suffocating temperatures in summer, when the World Cup is traditionally held. Temperatures can reach 42 degrees, which could affect the health of players and visiting fans. Qatar says the heat will not be an issue as all stadiums, fan zones and training areas will have advanced cooling systems, Reuters reported. However, FIFA officials have suggestedmoving the tournament to winter. Despite a controversial year, some analysts believe Qatar will retain the 2022 World Cup. “FIFA has confirmed its choice several times this year,” Nabil Ennasri, writer and Qatar specialist, told Al Arabiya News. FIFA President Sepp Blatter has said more than once that Qatar will host the World Cup, unless there is a “huge upheaval” or new evidence of wrongdoing. In 2015, the country is due to host the World Men’s Handball Championship, and is among six bidders to host the basketball World Cup. Qatar spent hundreds of millions of dollars to buy French football club Paris Saint-Germain, and has been paying $40 million a year for football star Lionel Messi and his teammates to wear “Qatar Airways” on the front of their Barcelona shirts. James Dorsey, author of the book “The Turbulent World of Middle East Soccer,” told Al Arabiya News that if Qatar loses its right to host the 2022 World Cup, there will be economic losses, including money spent constructing stadiums and hotels. The cost of building stadiums and hotels is forecast at $16 billion. The additional infrastructure required to host the event could push total costs to $200 billion. Dorsey said some countries such as the UK, which competed against Qatar for the World Cup “and feel very bitter about the outcome,” are likely to continue criticizing the emirate. “The British press, some British parliamentarians and some sports officials well keep on trying to take away the World Cup from Qatar,” he said. Qatar has booked two recent successes in what has become an uphill struggle to improve its tarnished image: a papering over of its rift with Saudi Arabia and the United Arab Emirates sparked by Qatari support for the Muslim Brotherhood and reports that it may be interested in acquiring London Premier League club Tottenham Hotspur FC. The successes come against the backdrop of a host of news reports that have done little to polish Qatar’s controversial image. The possible Tottenham acquisition could generate a counter dote but risks reviving debate whether Gulf states are in part using the purchase of high profile soccer clubs as a reputational management tool or in the words of human rights critics reputation laundering. To be sure, Qatar’s reported interest in Tottenham is driven by more than its immediate reputational issues. Like its Gulf rival, the United Arab Emirates which owns Manchester City FC, Qatar has long been believed to want an English Premier League presence. Efforts a couple of years ago to acquire Manchester United foundered on disagreement over pricing. Qatar’s most prominent European trophy is Paris Saint-Germain FC (PSG) alongside sponsorships that include FC Barcelona. Yet, that is where the trouble starts. Reports in Israeli and Jewish media suggest that Barcelona may want to end its association with Qatar when their sponsorship agreement terminates in 2016. Barcelona is said to be concerned about persistent reports of Qatari involvement in the funding of terrorism, including its support for Hamas, the Islamist group associated with the Brotherhood that controls the Gaza Strip. Barcelona has yet to comment on the reports and it was not immediately clear whether or not they were part of an intermittent Israeli campaign to further sully Qatar’s image. Israel has criticised Qatar for its support for Hamas. Israel’s ambassador to the United Nations Ron Posner went as far as describing the Gulf state as a ‘Club Med for terrorists’ in an opinion piece in The New York Times. Reports of Qatari association with funding of terrorism however go far beyond Hamas, a group on which the international community is divided. No Arab state has proscribed Hamas despite brutal crackdowns on the Brotherhood in Egypt and the banning of the Brothers in Saudi Arabia and the UAE and their designation as a terrorist group by the United States and the European Union. The European Union’s designation was recently called into question by a ruling by the Court of Justice of the European Union that reversed the designation. Similarly, the banning of the Brotherhood by the three Arab states has not sparked similar moves by the United States, the EU or the United Nations, all of which have taken Egypt, Saudi Arabia and the UAE to task for human rights abuses, including in their crackdowns on the Brotherhood. Gulf states opted to gloss over fundamental differences over the Brotherhood with this month’s return to Doha of the ambassadors of Saudi Arabia, the UAE and Bahrain who had been withdrawn in March in protest against Qatari support for the Brotherhood and the holding of a Gulf Cooperation Council (GCC) summit in the Qatari capital. The fragility of the agreement to set aside differences was however evident from the fact that the summit was cut back from two days to one, assertions by participants that the proceedings had been tense, and the fact that Qatar has not broken its ties to the Brotherhood. To pacify its critics, Qatar earlier this year asked seven Brotherhood leaders to relocate from Doha but did not withdraw their residence permits or ask their families to leave. The group’s controversial spiritual leader, Sheikh Yousef al Qaradawi, a naturalized Qatari citizen and prominent fixture on state-owned Al Jazeera, remains resident in Doha, but has in recent weeks not appeared on the television network. It was not clear whether his disappearance from Al Jazeera is permanent or as in the past temporary. As part of the setting aside of their differences Qatar and Egypt have further agreed to gradually improve relations broken off as part of the Gulf rift and Qatari support for Mohammed Morsi, a Muslim Brother who was elected president of Egypt but removed from office in a military coup. Allegations of Qatari tolerance of funding of terrorism this month took a serious turn with the identification as a global terrorist by the US Treasury of Abdullah al Nuaimi, reportedly a former head of the Qatar Football Association. Mr. Al Nuaimi was one of several Qatari nationals that have been designated as terrorism financiers not only by the US but also by the EU and the United Nations. The Treasury charged that Mr. Al Nuaimi had “provided money and material support and conveyed communications to al-Qa'ida and its affiliates in Syria, Iraq, Somalia and Yemen for more than a decade. He was considered among the most prominent Qatar-based supporters of Iraqi Sunni extremists,” the Treasury said. It said Mr. Al Nuaimi had transferred at least $2.6 million to Al Qaeda, had served as an interlocutor between Qatari donors and Al Qaeda in Iraq and assisted the group in its media communications. It also said Mr. Al Nuaimi had channelled funds to Al Shabab jihadists in Somalia and Al Qaeda in the Arabian Peninsula (AQAP) in Yemen. Qatar has rejected allegations that it turns a blind eye to funding while Mr. Al Nuaimi has denied the Treasury claims. There has however been no indication that Qatar has launched an investigation of its own into the Treasury assertions. Mr. Al Nuaimi is believed to remain a free man in Qatar fuelling allegations that he has close ties to senior officials in the Qatari government and ruling family. A historian of religion, who was detained in 1988 for his opposition to government-led reforms particularly regarding women’s rights, Mr. Al Nuaimi was released in 1991 on condition that he no longer would speak out publicly. Although Mr. Al Nuaimi was originally arrested on the orders of the then emir, Sheikh Hamad bin Khalifa Al-Thani, he was received by Sheikh Hamad after the emir had ordered his release. Qatari newspapers said that the current emir, Sheikh Tamim bin Hamad Al Thani, who also serves as chairman of Qatar’s National Olympic Committee (NOC) and is a member of the International Olympic Committee (IOC) as NOC head gave Mr. Al Nuaimi an award for his contribution to Qatari sports in 2010. Sheikh Tamim was at the time crown prince. Qatar has defended the maintaining of open lines to all parties to a conflict as part of their mediation-focused foreign policies that allows the Gulf state to step in at times that others are unable to propose solutions or build bridges. “I am very much against excluding anyone at this stage, or bracketing them as terrorists, or bracketing them as al‑Qaeda. What we are doing is only creating a sleeping monster, and this is wrong. We should bring them all together, we should treat them all equally, and we should work on them to change their ideology, i.e. put more effort altogether to change their thinking,” Qatari Foreign Minister s Khalid bin Mohamed al-Attiyah told an international security conference in Manama in December 2012. Al-Attiyah was referring to Syria but his remarks go to the heart of Qatari policy. Qatar shares with its Gulf detractors a desire to ring fence the energy rich region from the winds of political change that have recently swept the Middle East and North Africa. But contrary to its critics, it believes it can best do so by supporting forces of change elsewhere in the region. Its approach appears to have a degree of resonance among the Arab public. Despite the fact that public opinion in the Arab world has soured towards the popular Arab revolts as a result of the coup in Egypt and the turmoil in Libya, Yemen, Iraq and Syria according to recent research by Zogby Research Services, most of those polled with the exception of Saudi and UAE nationals felt that Egypt was far worse off following the military coup. Only a majority of Lebanese and Emiratis believed that the Brotherhood had played a negative role in Egypt but only Turks said that the group played a positive part in their own country. In Egypt itself opinions were evenly divided, suggesting that popular support for the Brotherhood as increased since the crackdown on the group by general-turned-president Abdel Fattah Al Sisi. With the exception of Egyptians, Emiratis and Saudis, most of those polled judged Saud Arabia’s role in the region as negative. While Qatari positions did not witness a wholesome rejection in the poll, its image problems were worsened not only by the terrorism designations and the Israeli campaign but also efforts by the UAE to undermine its rival’s credibility. And the problems challenging Qatar’s image don’t end there. World soccer body FIFA is set to decide in March on the dates for the 2022 World Cup to be hosted by the Gulf state. That decision coincides with a deadline for the creation of an independent commission to oversee reform of Qatar’s controversial labour sponsorship ship system that puts migrant workers at the mercy of their employers. The system has been denounced by trade union and human rights activists. A Qatar-sponsored study of its labour legislation by British-based law firm DLA Piper recommended the establishment of the commission. FIFA executive committee member Theo Zwanziger, who is in charge of working with Qatar on the labour issue, warned that Qatar could be deprived of its hosting rights if it failed to meet the deadline. Further tarnishing Qatar’s image was an Associated Press investigation that disclosed that Qatar paid foreign workers to attend soccer matches in otherwise often empty stadia to counter often biased criticism that it lacks a soccer culture or history. A poll among Qataris earlier this year cited the paying of migrant workers to be fans as a reason for reluctance to attend matches, alongside among others weather, scheduling, and traffic. A Qatari acquisition of Tottenham would no doubt at least temporarily refocus some of the negative reporting on the country. But it could also revive assertions that wealthy Gulf countries are seeking to launder their reputations through soccer acquisition. Human Rights Watch charged the UAE with just that in 2013 while former English Football Association chairman Lord Triesman called for making a country’s human rights record one of the criteria for establishing whether a state entity or member of a ruling family passes the "fit and proper person test" for ownership of a Premier League club. While Syrian and Iraqi Kurds battle against the Islamic State organisation, Sunni Muslim Iranian Kurds are campaigning for greater rights within the mainly Shiite Islamic republic. President Rouhani’s approach appears to be producing results. MORE THAN than three years into Syria’s brutal civil war, Syrian Kurds have carved out an entity of their own close to the border with Turkey. Their battle against Islamic State, the jihadist group that has conquered chunks of Syria and Iraq, for Kobani, a stone’s throw from the Syrian-Turkish border, symbolises Syrian Kurdish aspirations. It has galvanised Turkish Kurdish emotions at a time of fragile peace negotiations between Turkey and the insurgent Kurdish Workers Party (PKK). Across the border in northern Iraq, Iraqi Kurdish militiamen or Peshmerga, (those who confront death), man the frontlines against the jihadists in defence of their semi-state. Meanwhile the Peshmerga’s allies, the 60-country coalition the United States has marshalled against Islamic State, seek to ensure that Iraqi Kurdistan remains part of a restructured Iraqi state. From their vantage point, Iranian Kurds who account for 11 percent of Iran’s 77.5 million inhabitants, are no less fervent about their aspirations but keen to avoid the chaos and violence enveloping their Syrian and Iraqi brethren. To them, Iran’s Islamic republic, established with the fall of the Shah in 1979, constitutes a bulwark against the violence that has enveloped much of the Middle East. Yet, the Iranian Kurdish campaign, rooted in a bloody insurgency in the first decade after the toppling of the Shah, goes to the core of identity issues fuelling conflict across the Middle East; it poses no less a challenge to an Iran that has long denied its minorities communal political rights. Their decades-old struggle takes on added importance in a country in which 50 percent of the population belong to non-Persian minorities and a region in which ethnicity and sectarianism are redrawing borders. Suppression of the Iranian Kurdish insurgency in the 1980s was but one instance of post-revolution Iranian efforts to pacify the country’s minorities amid suspicions that Iran’s multiple distractors had sought to fuel ethnic unrest. Iraq launched in 1980 its eight-year long Saudi- and Kuwaiti-backed war against the newly established Islamic republic - in the vain hope that the predominantly Arab population of the southern Iranian province of Khuzestan would rise in revolt and welcome Iraqi troops as liberators. Iran suspects the United States of supporting Jundallah, a shadowy group that has claimed responsibility for more than 350 deaths in a series of bombings since 2007 in Sistan and Balochistan, Iran’s largest, most impoverished predominantly Sunni, south-eastern province. In Tabriz, the capital of the predominantly Azeri province of Eastern Azerbaijan, Traktorsazi FC, the football club, has emerged as a symbol of an Azeri national identity. Its stadium has been the scene of a number of environmental and nationalist protests and clashes with security forces in recent years in which fans chanted secessionist slogans. “The main (Iranian concern) is that the idea of Turkism is strengthening in South Azerbaijan,” News.Az, a pro-Azeri news website, quoted Saftar Rahimli, a member of the board of the World Azerbaijani Congress, as saying. Rahimli was referring to Eastern Azerbaijan by its nationalist Azeri name. Unrest among Azeris, Iran’s largest ethnic minority, despite the fact that many Azeris have risen to high positions and exert influence within government, the military and the security forces, suggests that Iranian attempts to silence political demands by enhancing individual social and economic rights is failing. Recent events in Iraq and Syria have refuelled the aspirations of a new generation of Iranian Kurds who fear they may be left behind. "We feel we have lagged behind and fallen from first position (among Kurds) to the fourth," a Kurdish activist recently told the Financial Times. Like the PKK which has moved from pan-Kurdish aspirations to demands for greater freedom and self-rule within Turkey, Iranian Kurdish ambitions focus on equal rights and autonomy. They complain about being treated as second class citizens and as a security risk despite significant investment in Kurdish regions that has substantially elevated educational levels but failed to reduce unemployment of almost 30 percent. Stepped-up Iranian Kurdish activism has sparked divisions in the Tehran government about how to respond and driven fears that US support for the Iraqi Kurds as well as Kurdish fighters in Kobani, and past and current Israeli support for the Kurds, could mean that Iran’s foes may want to fuel conflict in Iranian Kurdistan. Reformists and hardliners are united in their rejection of federalism which would involve granting other minorities the same right and a restructuring of the state that would significantly undermine the regime’s grip on power. Yet, in contrast to the Revolutionary Guards who advocate repression of dissent, President Hassan Rouhani sees economic development and inclusion of Kurds in his efforts to grant Iranians greater individual rights as the way forward. Iranian Kurdish leaders denied a statement in parliament by Intelligence minister Mahmoud Alawi that he had met in October with representatives of the Kurdish Democratic Party of Iranian Kurdistan (PDKI) and the Organisation of Revolutionary Toilers of Iranian Kurdistan (Komala). President Rouhani’s approach appears to be producing results, first and foremost among which is a desire by activists to push their demands peacefully. Violence has in recent years been limited to isolated, small scale attacks by The Party of Free Life of Kurdistan (PJAK), an offshoot of the PKK (The Kurdistan Workers’ Party). Iranian Kurds concede that repression has eased considerably since Rouhani was voted into office last year even if hundreds of Kurdish political prisoners remain behind bars. A mass rally in October in support of Kobani was the first time Kurds were allowed to publicly gather in an expression of their Kurdish identity. Islamic Azad University, Iran’s largest university network, this year established the country’s first Kurdish Studies Centre. Expressions of Azeri nationalism in recent years would suggest that greater freedoms is ultimately unlikely to keep the nationalist Iranian Kurdish genie in the bottle. Some Kurds, nonetheless, believe Rouhani could succeed. "Even federalism can gradually wane if people see a fair distribution of power and wealth. Kurds are not Persians but are Iranians. The view that Iran belongs to us is gaining strength,” Omid Varzandeh, the centre’s director, told the Financial Times. James M. Dorsey is a Senior Fellow at the S. Rajaratnam School of International Studies (RSIS), co-director of the University of Wuerzburg’s Institute for Fan Culture, and the author of The Turbulent World of Middle East Soccer blog. The adoption of a human rights declaration by the Gulf Cooperation Council (GCC) that was designed to shield wealthy Gulf monarchies including 2022 World Cup host Qatar from criticism by human rights and trade union activists is likely to increase pressure on the sports-focused Gulf state to significantly alter its controversial migrant labour system. That acknowledgement strengthens demands by human rights and trade union activists that Qatar embrace the principle of collective bargaining that would eliminate its system of setting wages for migrant workers according to nationality. Proponents of a radical reform of Qatar’s sponsorship or kafala system that puts workers at the mercy of their employers have argued that Qatar needs to introduce a uniform minimum wage and authorize collective bargaining – a key demand of the International Confederation of Trade Unions (ICTU), one of Qatar’s toughest critics. Standards for the working and living conditions of migrant workers issued by the Qatar Foundation (QF), one of two government institutions alongside the 2022 Supreme Committee for Delivery & Legacy at the forefront of a push for change, insist that “workers shall receive equal pay for equal work irrespective of their nationality, gender, ethnic origin, race, religion or legal status.” The 2022 committee’s standards stress equal treatment of workers. A report to the foundation by migration scholar Ray Jureidini said that “it is not entirely certain how the comparative wage differences have been derived, or why.” The report recommended introduction of a minimum wage to eliminate discriminatory wage policies as part of an effort to ensure Qatar’s competitiveness. 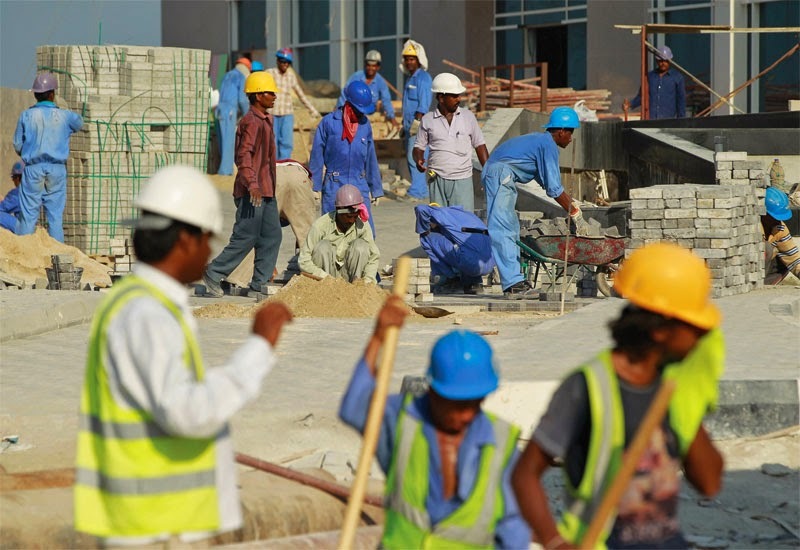 “If Qatar wishes to have wage rates of migrant workers set by supply and demand in a local labour market, then it will need to lift the current kafala sponsorship system, allow workers to change employers without sponsor approval (as is now the case in Bahrain), allow collective bargaining to take place that will establish wage rates, terms and conditions of all occupations filled by non-Qataris in the country”, Mr. Jureidini said. A similar recommendation was made by the United Nations Special Rapporteur for migrants’ human rights. With the executive committee of FIFA meeting in Morocco, a member of the committee, Thomas Zwanziger, warned that the world soccer body could deprive Qatar of its World Cup hosting rights if the Gulf state failed to implement recommendations that included the creation of a minimum wage for each category of construction worker made by a Qatar-sponsored review of its labour legislation by British-based law firm DLA Piper. The review called for far-reaching reforms including abolition of the kafala system and proposed the establishment of an independent commission to oversee the reform process. 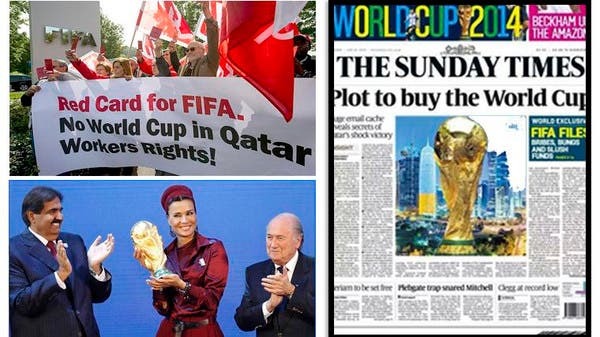 “The Qataris have to establish by the 10 March 2015 deadline the independent commission proposed by the Piper report that would regularly control human rights on World Cup construction sites and monitor progress… We had hoped that we would take a big step forward with the Piper report because we were under the impression that the Qataris understood… Unfortunately, almost nothing has happened until today. I strongly doubt the will to change something of the Qataris,” German publication Sport Bild quoted Mr. Zwanziger as saying. Qatar has been slow in acting on pledges it has made as well as recommendations in a slew of reports published in recent years. Qatari officials said a reform of the country’s labour law was likely by the end of this. The reform is expected however to fall far short of the demands of activists and the recommendations made in the various reports. Moreover, the standards enunciated by the foundation and committee are only binding for parties contracting with the two institutions. Qatar has so far missed an opportunity to curry good will with its critics by enshrining those standards in national law. Qatar’s reluctance to act decisively in response to the criticism of its labour system is rooted in its demography; foreigners account for 88 percent of Qatar’s population. As a result, Qatar’s fear that their need for foreign labour at all levels of society threatens their grip on their state and culture. That fear means that the government is caught in a Catch-22: it needs to respond aggressively to international criticism but move gradually to maintain domestic cohesion. Demography has also played into allegations by Qatar’s distractors that the Gulf state lacks a passionate fan culture. Stadia are often largely empty during sporting events. To counter the criticism, Qatar allegedly pays migrant workers up to 30 Qatari riyals ($8) to attend sporting events at times dressed up in Qatari national dress. “For this pittance, workers from Africa and Asia sprint under blinding sun in the Doha industrial zone where they're housed and surround a still-moving bus like bees on honey. They sit through volleyball, handball and football, applaud to order, do the wave with no enthusiasm and even dress up in white robes and head-scarves as Qataris, to plump up ‘home’ crowds,” said John Leicester, an Associated Press reporter who joined one of three busses carrying some 150 workers paid to attend a volleyball match. Egyptian and Turkish soccer pitches are set to re-emerge as battlegrounds between militant, street battle-hardened fans and authoritarian leaders in a life and death struggle that involves legal proceedings to brand the supporters as terrorists and efforts to undermine their widespread popular base. Egyptian fans, barely a week after storming a Cairo stadium in advance of an African championship final, have vowed to break open Egyptian premier league games that have been closed to the public for much of the past four years. Fans played a key role in mass anti-government protests that in 2011 toppled President Hosni Mubarak. Similarly a nationwide boycott of a government electronic ticketing system in Turkey viewed by fans who were prominent in last year’s Gezi Park protests against the country’s leader, Recep Tayyip Erdogan, as a way of identifying them and barring them from stadia has so far all but defeated the effort. The struggles in Egypt and Turkey are heating up as criminal legal proceedings against militant fans or ultras are set to open in Cairo and Istanbul. In Istanbul, a trial begins on December 16 against 35 members of Carsi, the nationally popular support group of storied club Besiktas JK, accused of belonging to an armed terrorist organization and seeking to overthrow the government. In Cairo, courts are preparing to hear a series of cases initiated by the head of the Egyptian capital’s Al Zamalek SC, Mortada Mansour, a controversial fixture of the Mubarak era and close associate of general-turned-president Abdel Fattah Al Sisi, charging that the club’s militant support group, Ultras White Knights (UWK), are terrorists who sought to assassinate him. Denying the allegations that led to the arrest of scores of UWK members, the group has dubbed Mr. Mansour ‘the regime’s dog.’ UWK leaders have gone into hiding to evade security forces. In a statement, the Istanbul Bar Association denounced the charges against Carsi as belonging to the “fantasy world” of prosecutors. “What they are trying to do here is to dilute the concept of a coup in order to spark fear in people, justify police violence that may occur in the future, and intimidate a nation. The law cannot be manipulated for such purposes. Prosecutors’ right to open a case must be restricted by logic and rules of law,” the statement said. The charging of the fans follows several ongoing court proceedings against other protesters in which prosecutors were also seeking harsh sentences. The cases were being prosecuted by a judiciary that like the police force in the past year has largely been cleansed of alleged supporters of Fethullalh Gulen, a frail, self-exiled 73-year old preacher, head of one of the world’s largest Islamist movements and one time Erdogan ally, whom the president accuses of seeking to create a parallel state in Turkey. The legal proceedings in Istanbul and Cairo are part of an effort by the Egyptian and Turkish governments who despite differences over the Muslim Brotherhood both see cracking down on militant soccer fans as a pillar of their campaigns to severely restrict if not outlaw peaceful protest and dissent. A vow by Ultras Ahlawy, the militant support group of Zamalek Cairo rival Al Ahli SC, to force their way into stadia where Egyptian premier league games are played came a week after they stormed Cairo’s International Stadium to make their point. It also came as Ultras Nahdawy (Renaissance Ultras), play a key role in months-long student protests on university campuses and in local neighbourhoods in the Egyptian capital against Mr. Al Sisi’s repressive regime and in favour of academic and other freedoms. Nahdawy, whose name refers to the term used by the Brotherhood to describe its political and economic program, is the only militant soccer group that openly identifies itself as political and is not aligned with a club. The group, formed by Ahlawy and UWK members who sympathized with the Brotherhood that has been brutally suppressed by the Al Sisi regime and outlawed by Saudi Arabia and the United Arab Emirates, has since distanced itself from the group. Its leadership consists largely of university students while its rank and file are often still in high school. "We took the culture of the ultras in the stadiums and tried to copy and paste it into the street," a Nahdawy member and Ahli supporter told The Los Angeles Review of Books. For a regime that has shown little mercy for its opponents, the Sisi government has balanced its tacit backing for the legal proceedings against UWK with a more deft approach to Ahlawy that holds the military and security forces responsible for the death of more than 70 of its members in a politically loaded brawl in 2012 in Port Said. The Egyptian Football Association (EFA) recently postponed a match between Al Ahli and the Port Said’s Al Masri SC, which haven’t faced off since the worst incident in Egyptian sport history. 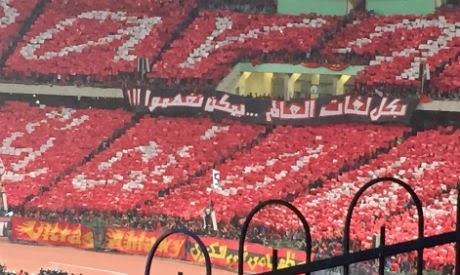 The security forces’ response to Ahlawy’s insistence on attending matches will serve as a litmus test of whether their decision to negotiate rather than confront the fans before the African match constituted an exception in a successful bid to ensure that the game would take place or whether it signal’s the first softening of Mr. Al Sisi’s policies that have led to sentencing to death of hundreds of Muslim Brothers, the deaths of more than 1,000 protesters, and the incarceration of tens of thousands of critics of his regime. Brutal police action radicalised the ultras in the waning years of the Mubarak regime and turned stadia into the only battlegrounds on which his opponents persistently confronted his repressive forces physically. The rise of the ultras and other militant fan groups not only in Egypt but also elsewhere in the Middle East and North Africa has repeatedly prompted governments since the popular revolts of 2011 to close stadia to the public. In an exception to the rule, Algerian authorities have tacitly agreed to allow fans to vent their pent-up anger and frustration in stadia provided they don’t take it from there into the streets. In Turkey, the government has sought to drive a wedge between militant fans and other supporters by arguing that e-ticketing was a way to combat illegal ticket scalping, increase tax revenues and ensure that stadia are safe for families. To be fair, Turkish stadia have a long history of violence. A third of Carsi’s original founders have died since the group’s founding in the early 1980s a violent death. A truce arranged at a gathering of heavily armed rival supporters after a Besiktas fan was trampled to death in 1991 by his Galatasaray SK adversaries reduced but did not put an end to the violence. Two Leeds United fans in Istanbul for their team’s match against Galatasaray were stabbed to death in 2000 during a soccer riot on Taksim. Stray bullets fired into the air to celebrate the Turkish team’s victory killed a third person and wounded four others. The high stakes battle over e-ticketing goes to the heart of a struggle for Turkey’s soul that erupted with the mass anti-government Gezi Park protests in Istanbul in 2013 sparked by Mr. Erdogan’s increasingly illiberal policies that seek to impose greater control on people’s lives and restrictions on personal and political freedom and unfettered access to information. Fans moreover are irked by the president’s manipulation of due process in what was the most serious match fixing scandal in the history of Turkish soccer, a run-up to his squashing of an investigation into the most serious corruption scandal in his career. Plummeting stadium attendance as a result of the e-ticket boycott has severely affected ticket sales. A match in October in Istanbul’s 82,000-seat Ataturk Olympic Stadium between Besiktas and Eskeshehirspor Kulubu that would normally have been attended by some 20- 30,000 spectators drew only 3,000 fans. Ticket sales for Galatasaray matches are down by two thirds with fans gathering in cafes and homes to watch matches they would have attended in the past. The boycott prompted the government to suspend the e-ticketing system for a friendly in November between Turkey and Brazil. As a result, sales spiked with more than 40,000 tickets sold for the match shortly after the suspension. The boycott, the court cases and the battle for stadium access all are elements of a struggle by militant soccer fans in Turkey and Egypt for their existence in an environment in which some, particularly in Egypt, feel that their options are being cut off with violence one of the few alternatives left. “If anyone dies it’s a victory, if anyone goes to jail it’s a victory. And if we go back to the football stadium it’s the biggest victory for us,” a UWK member told the Los Angeles Review of Books. The young men are leading members of the Ultras White Knights (UWK) — a group of hard-core football fans of Zamalek SC, one of Egypt’s most successful football clubs. After we find a safe place to talk, they occasionally glance at the tape recorder as if it might explode. Ultras rarely speak to the media, but this is an exceptional time. Dozens of members have been arrested as the group has become locked in an escalating feud — characterized by bitter accusations, protests, pranks, and an alleged assassination attempt — with lawyer, politician, and Zamalek Sporting Club President Mortada Mansour, one of Egypt’s most influential and infamous men. Mansour has brought a series of private lawsuits against the UWK, and a court will soon decide whether the group should be banned and designated as terrorists. It had been a few days since Zamalek lost on penalties in the Egyptian Super Cup to their Cairene arch-rivals Al Ahly. The Ultras White Knights were still raw about the defeat. “We lost because God punished Zamalek for Mansour,” deadpanned one of the Ultras. The Ultras’ 62-year-old nemesis was a high-profile figure under Hosni Mubarak. He is a fervent supporter of the military and an ally of President Abdel Fattah Al-Sisi. Mansour ran a short-lived presidential campaignearlier this year, during which he said he would ban social media if it proved to be a threat to the nation’s security, and would declare war on Ethiopia if it maintained its position on construction of a controversial dam. Less than a week later Mansour announced that he was pulling out of the presidential race after receiving a sign from God that former military chief Al-Sisi would win. Mansour is a polar bear of a man: heavyset and lumbering, with gray-white, cumulus hair. He is renowned for his foul-mouthed and theatrical denunciations of opponents. His mouth gapes when he is animated, and he waggles his finger in admonishment — his glance darts around, as if daring someone to challenge him. The rhetoric between Mansour and the Ultras has long been testy, but since March 2014, when Mansour became Zamalek’s president, relations have descended into all-out acrimony. The Ultras accuse Mansour of preventing them from entering the club’s sporting complex and failing to work toward lifting a ban on spectators attending matches. In early August the clubhouse was vandalized. Mansour blamed the Ultras, while the UWK denied responsibility. The stakes of the feud were dramatically upped in the early hours of August 17. Mansour alleges that he was leaving the sporting club when a group of men, armed with shotguns, attempted to assassinate him, injuring three people; Mansour emerged unscathed. He accused the attackers of being both Ultras and members of the Muslim Brotherhood. The Ultras claim that either nothing happened, or Mansour staged it. “This is all a game,” dismissed one leading Ultra. Several UWK members were arrested during the following days in connection with the alleged attack, and many leading Ultras went into hiding. The Ultras responded to the arrests by taking to the streets — a risky move since protests have effectively beenbanned. Dozens were arrested. Although 36 members of the UWK were acquitted on October 30 of breaking the Protest Law, 11 Ultras remain accused of trying to assassinate Mansour, and two are charged with trashing the clubhouse, according to the Ultras’ lawyer Tarek El-Awady. Three more Ultras were arrested after an incident on October 12, when some men threw a bag of murky liquid at Mansour on the street. Mansour declared that it was nitric acid, while the Ultras said that the bag contained a scatological cocktail of urine and feces, and were happy to claim responsibility. The court hearings are taking place over the next few weeks and a final ruling on Mansour’s lawsuit to ban the UWK as a terrorist organization is expected soon. “I see the Muslim Brotherhood behind them, using their last supporters — the Ultras — to show the world that there is no stability in Egypt and to create problems for the current regime at universities and at stadiums,” Amir Mortada Mansour told me. (Amir is Mortada Mansour’s son, a lawyer and the director of his father’s office.) Mortada Mansour did not want to talk. Amir cut a fairly different figure from his father. He was all angles: thin, with a sharp haircut and a V-neck shirt. Small models of knight helmets, one sporting a red mohawk, sat on his desk. Although clearly a little uncomfortable talking to the media, he was calm and polite. He began smoking, settled into his chair, and riffed on the awfulness of the Ultras. Amir repeatedly returned to the alleged assassination attempt: “This is something we won’t forget.” When challenged on his evidence that the Ultras were behind the alleged attacks, he said that some Ultras wrote, “We are going to end everything” on Facebook. “We know what they meant,” said Amir. He also claimed that cameras close to the club recorded the incident and identified Ultras members. Ultras groups have fought each other in the past but the academic Shawki El-Zatmah has argued that “a substantial part of the hooliganism and fighting, even when it was among two different Ultras groups, was often aimed at the security forces of the regime and was viewed by the Ultras as a form of ‘safe resistance’ to the Mubarak regime.” El-Zatmah also documented instances where the Ultras used fireworks to cause damage to stadiums to force their clubs to accede to their demands, such as firing an unpopular coach. The leading UWKs are far from the bald, beer-bellied caricatures of English football hooligans, or the mostly far-right Ultras groups in mainland Europe. UWK leaders are in their early 20s and middle-class — some are slightly nerdy university students. Most have been in the Ultras since its inception. They joke about girls, beer, and smoking hashish, but they also talk about books and travel — they are wealthy enough to travel abroad to watch the team play in regional competitions. To be an Ultra is fundamentally to be a fanatic. They describe their devotion to Zamalek in the terminology of love and war, loyalty and sacrifice. They are a collective that stresses solidarity. They tend to oppose the commercialization of football, and regard many of the players as mercenaries and the club’s management as corrupt lackeys of politicians. When Egypt’s stadiums were open, Ultras would often avoid paying money to the club by vaulting the turnstiles. When the Ultras White Knights were formed, Zamalek SC was struggling. The UWK tried to jump-start their team back into life through the sheer force of their passion, expressed through chants, flares, songs, banners, humor, and vitriol. But the beliefs of the rank-and-file membership run the breadth of the political spectrum. When the Muslim Brotherhood–affiliated President Mohamed Morsi was ousted by the military last summer, Ultras were present at both the pro- and anti-Morsi protest camps. To be an Ultra is also to seek catharsis: to vent the inherent frustrations in being young and Egyptian. Like Ultras Ahlawy — hard-core supporters of Al Ahly — Zamalek’s Ultras White Knights were formed in 2007 during the dog days of Hosni Mubarak’s regime, which was over 25 years old and characterized by corruption, inequality, entrenched poverty, police brutality, and an aging, wealthy elite with little regard for young people. Mubarak’s son was being groomed to succeed his father and likely serve another generation more of the same. “We wanted something to make us one group; to put all our fears and all our problems behind us and just go to the stadium and chant and sing and support the team,” said the UWK. As the uprising against Mubarak broke out on January 25, 2011, the Ultras — both from Zamalek and from other clubs — were at the forefront of the street protests. When camel- and horse-riding assailants attacked and killed protesters in Cairo’s Tahrir Square on February 2, 2011 — what became known as the “Battle of the Camel” — the protesters held the square, in part due to the street-fighting effectiveness of different Ultras groups who battled the regime’s thugs and security forces. Mortada Mansour was later charged — and acquitted — of being one of the orchestrators of the attacks. Although the feud is partly fueled by the nature of Mansour’s personality and the character of the Ultras, some argue it should also be understood in a wider context of the authorities’ crackdown on dissent. The state has targeted Islamists, students, liberals, leftists, atheists, migrants, LGBT people, NGOs, publishing houses, and journalists — as well as the Ultras — following Morsi’s ousting on July 3, 2013. Thousands of protesters have been arrested or killed by the security forces. Prominent figures, such as ex–Al Ahly player-turned-TV pundit Ahmed Shobeir, have also called for the Ultras Ahlawy to be banned. But it’s unclear what a ban would mean in practice. Amir Mortada Mansour accepts that the Ultras don’t exist as a legal entity but says this is the problem: “No one is allowed to establish a group, organization, or party without permission, or recognition, under law.” Amir seems to suggest that the ban would give the authorities scope to arrest more members through association. Yet, the prohibition on attending matches arguably means that all Ultras groups have already effectively been banned in the most basic and painful way. “That has caused a lot of friction and a fair amount of the incidents you’ve had in the last year, and certainly part of the friction between the Ultras White Knights and Mansour you can trace back to the fact that spectators have been banned,” said Dorsey. Watching an Egyptian league match on TV in a Cairo café can be an eerie experience. The café’s audience erupts when someone scores. On the screen, players reel in celebration, while a hinterland of empty plastic seats stare blankly back at the camera. Spectators have been banned for much of the time following the 2011 uprising, and there has been a blanket ban on all league matches since thePort Said disaster on February 1, 2012 — the eve of the first anniversary of the Battle of the Camel. At least 72 people died in the disaster after Al Masry fans attacked Al Ahly supporters in Port Said’s stadium following a match. The police kept the stadium gates closed after the match had ended and reportedly removed barriers separating the fans; they also failed to confiscate weapons and stood aside as the attacks took place. Ultras Ahlawy members were the main target, and there was widespread speculation that the disaster was engineered by the authorities in order to attack the group and spread fear. Amir Mortada Mansour claims he wants fans to return to the stadium but that they “shouldn’t harm the club or involve politics in sports.” He said that an empty stadium diminishes the importance of the matches and deprives clubs of essential revenue. Amir says they have made proposals: that everyone attending matches should be a season-ticket holder and show identity cards, that CCTV should be used to identify hooliganism, and that political banners and chanting should be banned. He says, with some exasperation, that the Ultras have refused these proposals. Amir thinks that fans could initially return to stadiums in small numbers and that clubs could pay for private security to work alongside the police. The UWK say they reject the police being present at matches, although they would accept some private security, but they are not willing to compromise on their principles and say they will keep causing trouble until their demands are met: the release of imprisoned members, access to the clubhouse, a return to the stadiums without being controlled, and that the cases against them be dropped. Recently there has been a period of relative calm, although many Ultras are active as individuals in ongoing student protests. But it is tinder-dry calm, awaiting a spark. If the Ultras can’t return to the stadiums, and an official ban gives more energy and a legal veneer to the crackdown already underway, Thabet thinks the authorities’ actions could nurture violence, provoking some Ultras into joining more radical or militant groups. At the moment, these are just future projections. Thabet says he hasn’t heard of any Ultras joining domestic terrorist or militant groups, and the UWK leaders say that, although their anger is rising, they would never go to such extremes. The strength of the Ultras is hard to gauge, and public opinion is mixed in a society infused by football fanaticism. To some extent there is a generational divide; older people are more likely to see Ultras as a rabble, younger people are more likely to express support. Ultras are regarded as a threat because they are young and unruly collectives; they won’t do as they’re told, they’re angry, and they can fight. Even if their demands are met, many of them are still committed to the idea of revolution. The bind for Mortada Mansour and the authorities is that if a crackdown can trigger dissent, then the stadiums can inculcate it. Dorsey argues that, by insisting on their freedom within stadiums, the Ultras are “staking a claim to a public space, in a country that does not tolerate independent public space.” It is a swift move from dissent in the stands to disorder in the streets. Yet, the Ultras are facing a dogged opponent in Mortada Mansour, backed by a regime that has proven its determination to stamp out dissent through the unprecedented scale of its death toll. Whatever the outcome of the court cases, the fight will go on.